What are the factors involved to becoming a good tennis player? Tennis is incomplete without mental strength playing a part in the game. If a player does not work on his mental strength, then he can’t be a successful and professional player. Mental strength in tennis works as an energy booster and edges out a player when the physical nature of the game takes its toll on the players. Without mental strength, a player can’t win matches and most importantly can’t finish it well. A mentally strong player, even when faced with numerous setbacks, has the ability to turn things around during the match. Mental strength gives confidence and self-believe to a player, which improves the general play of a player, as well as their shot-making decisions. A tennis player has to do a lot of work on his fitness and health. These two factors are essential for any player who aims to compete professionally. However, with that said, it doesn't mean that fitness is not important for a leisure player; one must have a certain standard of fitness in order to enjoy the game as well. Tennis requires a lot of body movement, such as footwork, stretching and running, therefore to properly enjoy a game of tennis, it is good to maintain a moderately good level of fitness. As with all sport, a good habit of warming-up prior to starting your tennis game is essential. Players warm up before the game to avoid injuries during the game, as well as to enhance their flexibility. 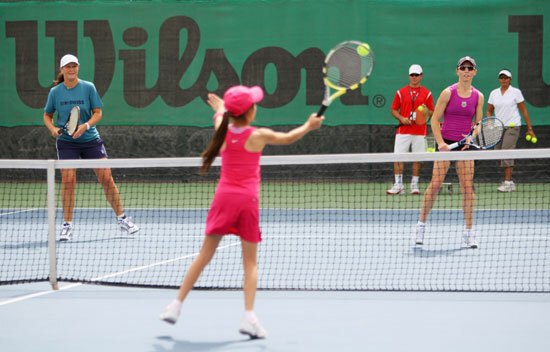 In tennis, warm-up exercises such as light stroke motions and mini tennis helps to get a player ready for the game and practice their strokes as well. It helps the body to gradually adapt to the intense pressure and exercise which it might experience during the game later on. Certain reasons which could lead to injuries in tennis could be due to wrong stepping, bad shot selection, low quality racket selection, lack of standard courts and lack of proper technique of playing shots. The importance of having a proper tennis shoe also cannot be over-emphasized; it is a necessity. A tennis player must be aware of the proper technique of shots while playing. Technique is not just about knowing how to hit the ball with the racket. It involves different kinds of strategy, such as the different grips used to hold the racket, placement of ball on opposite side, mental ability, shot selection and the ability to read your opponent's intention. Learning the basic techniques in tennis for a beginner is important as it helps in the overall improvement in the long run. Once again, technique is not just about utilizing both of our hands and our legs; mental strength is important as well. At times, when your physical ability is unable to match that of your opponent's, the correct technique used, coupled with your mental strength, may eventually prove vital in determing the winner. Players like Roger Federer, Rafael Nadal and Novak Djokovic are considered today’s best players to follow for everyone. It is good to read up online on different techniques used in tennis, as well as consult your tennis coach about it if you are having lessons. Tennis is not a sport which you can master in a matter of weeks or months. It requires continuous effort and learning. Thus, always stick to your training schedule tightly if you are thinking of playing tennis professionally. For professional players, any training session missed could be detrimental to their overall training regime as they might lose the momentum which they have been carrying. Additionally, prolonged period of hiatus from the sport may eventually cause you to be weaker in certain aspects of the sport. Continuous mental strength and effort makes a player consistent with his game. If you are a professional player, then you will know that consistency and practice makes a player better. However, this should apply not only for professional players, but amateur and club players as well. The importance of regular practice cannot be undermined if you aspire to be a top-class tennis player. With that said, if you love the game as much as I do, I'm sure you wouldn't want to be missing any tennis lessons at all, because that is the time where I really enjoy coaching tennis enthusiasts. From "Effective Tips For Beginners" To "How To Play Tennis Efficiently And Become A Better Player"